In an earlier post, I talked about ring sizing but did not go into details about how that is done. So, here are a few highlights. Most rings are manufactured in a standard size, but it is not exact. 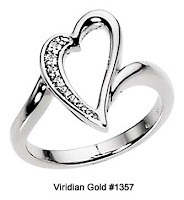 The majority of rings are made for women, in a nominal size 6. If a specific style for a man is offered, it will usually be a nominal size 10 (recently, some manufacturers have begun using 7 and 11 as nominal sizes). If you require a size 8 in our Diamond Heart Ring, #1357, for instance, it will have to be "sized up" by 2 sizes from a nominal size 6. 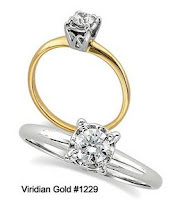 Sizing up, for most ring styles, requires that the jeweler cut the ring's shank, open the gap, and insert more metal. The metal must then be soldered to the original ring and smoothed and polished so that the modification is invisible. If the ring is 14K gold, then 14K gold is used for both the new metal insert and the solder, so that the ring is still composed of all 14K gold. If the nominal size 6 ring was required to be a size 5, then it would be "sized down" by 1 size. This is done by cutting out the required amount of metal from the shank and re-joining the gap with matching solder, and polishing the joint. Many rings have designs which completely encircle the ring, such as our Rosary Ring, #1391. These styles usually cannot be sized by cutting and soldering as described above. Instead, they are either manufactured in many specific sizes, or their sizes can be slightly altered by stretching or compressing the ring using special tools and equipment which does not deform the design. As you can see, sizing a ring requires a jeweler with great skill and a keen eye for quality. It should be impossible for you to see where the ring was sized with the naked eye, if the work was done properly. 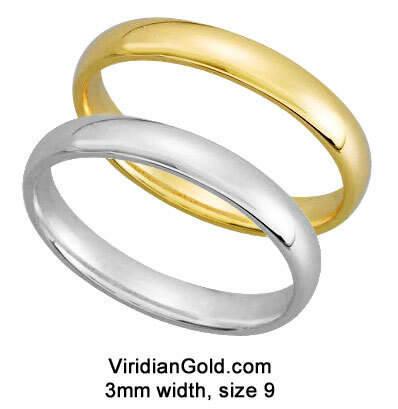 At Viridian Gold, our jeweler is a veteran craftsman with many years of jewelry design, creation and repair--and, we also inspect his work prior to packing your ring! In addition, most of our rings are also offered as "unsized", so that you can take the ring to a local jeweler for sizing if you wish. Engraving the old fashioned way! Omega Chains: Flexible or Inflexible?